What happened to the “Amens”? 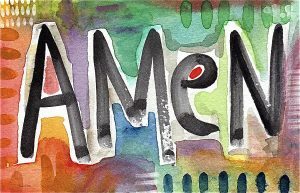 Scholars believe that “Amen” may be the most widely known word in human speech. “Amen” means yes, so be it, verily, I believe it. Christians aren’t the only ones who say it. Jews and Muslims use “Amen” as a concluding word in prayers, too. It is likely derived from the Hebrew word emuna which means faith or emet which means truth. In all its variations, the word lives on — but no longer at the end of our hymns. What happened? Sometimes, they were long and drawn out, in wobbly, full vibrato and dramatic voices. Other times, the amens were short and sweet. Almost always, there was modulating harmony from the altos and basses in the congregation. Now, it seems, we haven’t sung a closing “amen” in years, except to end the Doxology. What happened? In 1861, Hymns Ancient and Modern was published for use in the Church of England. The editors of this hymnal added “Amen” to the end of every hymn, thinking to revive a tradition from the Middle Ages. 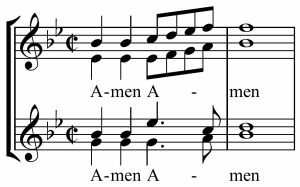 Later, British hymn scholars concluded that this was an historical error and, in the 1920s, nixed the use of “Amen.” After all, Martin Luther didn’t sing amen, nor did Isaac Watts or the Wesley brothers. Following their British cousins, American Protestants tacked amens on the end of hymns from the 1880s to the 1970s, when they, too, reversed course. One by one, the denominational hymnals were published without amens — first the Episcopalians (1982), then the Methodists (1989) and the Presbyterians (1990). 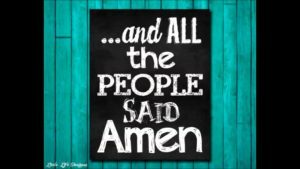 Now, when we hear an Amen, it is usually spoken at the end of our prayers or shouted out by an enthusiastic member of the congregation or sung in elaborate harmonies as a choral response — a Three-Fold or Seven-Fold Amen, uplifting and fun to sing. Acknowledgement: Amen art at top of post is by Linda Woods.